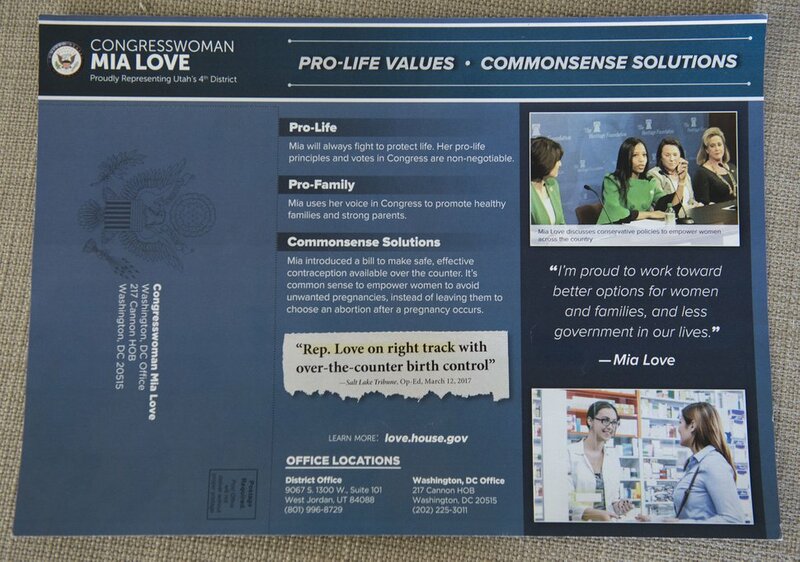 Utah Rep. Mia Love sent a mailer with a quote attributed to The Salt Lake Tribune. It was from an opinion piece she wrote herself. (Al Hartmann | The Salt Lake Tribune) Rep. Mia Love (R-Utah) speaks to the Salt Lake Tribune editorial board Thursday, Feb. 22, 2018. A government-paid mailer sent by Rep. Mia Love features a big-type quote that it attributes only to “The Salt Lake Tribune.” She never mentions it actually is from a opinion piece that she wrote herself for the newspaper’s commentary page. Such labeling “seriously misleads readers into believing that The Tribune as an institution supports Love’s environmental positions,” Tribune Editor Jennifer Napier-Pearce wrote to Love’s office. “At best it lacks transparency; at worst, it’s deliberately deceptive,” she added. It is the second such controversy involving Salt Lake City’s two major newspapers. The Deseret News complained last week about another mailer that Love sent at government expense where the newspaper’s masthead appears over a statement not written by its editorial board, but by outside authors in a signed opinion piece. “The mailer misrepresents a statement of a guest opinion writer as an official position of the Deseret News,” Deseret News Editor Doug Wilks and its opinion editor Boyd Matheson wrote at that time, noting that a later mailer properly attributed the statement. 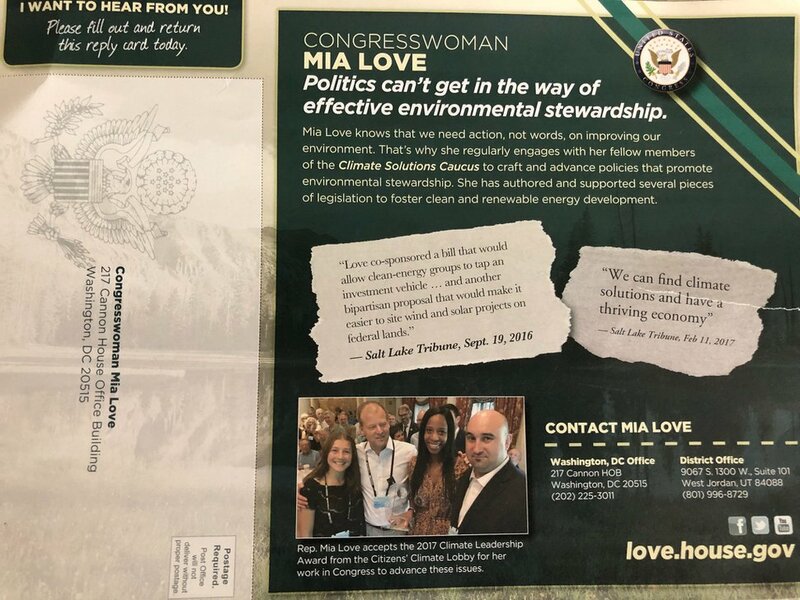 Mailer sent by Rep. Mia Love created controversy by attributing only to the "Salt Lake Tribune" a quote she actually wrote in a guest column for the newspaper. He said it was mailed out a year ago and raised no complaints until the campaign of her opponent, Democratic Salt Lake County Mayor Ben McAdams, pointed it out to reporters. Piatt said that came after records show that Democratic Party officials inspected House files containing copies of Love’s government-funded mailers, looking for dirt. “This is a bullying tactic to benefit her political opponent and distract from Rep. Love’s work in Congress,” Piatt said. He added that “another Utah congressman has sent out similar mailers and didn’t receive any criticism from The Salt Lake Tribune.” He provided copies of two mailers sent by Rep. Chris Stewart, R-Utah, which quote the Tribune as saying he was appointed to the powerful House appropriations committee. The quotes in the Stewart mailers, however, are from a news article written by a Tribune reporter — not an outside opinion piece. The other quote comes from a 2016 Tribune news story about a clean energy group spending $100,000 to campaign for Love, but it deletes a reference mentioning the oil and gas industry. Love also sent out another mailer earlier this year about abortion that may be murky about whether the Tribune or someone else is praising her stands on that issue. This mailer was sent to voters in Rep. Mia Love's district. It was the headline on what is correctly identified as an “op-ed,” or an outside opinion column. But it does not say who the author is. It was written by Shelby Cate, a University of Utah graduate student in business. The controversy at the Deseret News arose over a mailer that Love sent about her efforts on a banking bill. 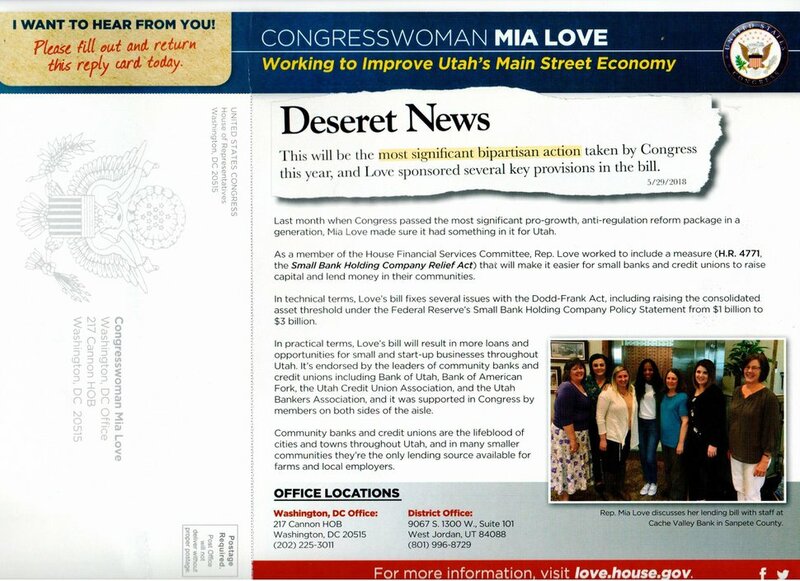 This mailer by Rep. Mia Love was criticized by the Deseret News as creating the false impression that she was being praised by its editorial board instead of guest columnists. The quote came from an op-ed written jointly by Scott Simpson, Utah Credit Union Association president and CEO, and Howard Headlee, president and CEO of the Utah Bankers Association — not from the Deseret News editorial board. Controversy also arose over government-funded mailers in Love’s 2016 campaign. Democrat Doug Owens at that time attacked her use of nearly $275,000 in government funding for mailers he said were little more than thinly veiled campaign ads — and amounted to campaigning with government money. In a debate between Love and Owens that year, Love dismissed Owens' attack on the topic, saying, “The whole idea of the self-promoting mail is absolutely dishonest, I mean both papers actually agreed that it was dishonest and they rarely agree.” However, neither newspaper wrote editorials on that topic.